Here we have another Australian sheep dog which can successfully drive and muster livestock from point A to point B without any sort of human command intervention. These medium size dogs are available in a variety of colors. Kelpies usually are distinguished by its type of work – they are either hard working canines that tend flocks or they are the show animals that appear clean and trimmed at all times. These show dogs are particularly breed with appearance in mind while the working classes of Kelpies are selected for their individual abilities at herding. In all, realities there really are no specific color guidelines that can be followed for these excellent animals. Some breeders who may raise the dogs for show purposes might perhaps channel specific color combinations together for sales purposes while the farmer really does not care so much how the dog look but more so on its abilities and talents. Don’t get me wrong as these are a registered breed of dog and in fact the Australian dog fanciers have actually established not only one but two distinct registries for them. The first one is for the working class of Kelpies and is known as the Working Kelpie Council or WKC. Its primary function is to develop standards for these working animals. It is important to keep in mind that due to the wide standards for the working dogs they generally can not be used for show purposes at all. 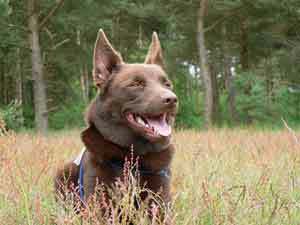 If the animal is to be breed for show purposes it will likely be registered with the Australian National Kennel Council. This organization encourages strict standards in color and other matters that would benefit those dogs that would perform in the dog shows. Unfortunately, in America the American Kennel Club does not recognize the Kelpies as a specific breed therefore they are prevented from show competition in the United States. A Kelpie that is working on a ranch can effectively be an inexpensive addition to the farmers working force when it comes time to mustering their livestock. In fact one dog can actually take the place of three or four able bodied men in this respect. These dogs take their jobs very serious and usually never lose an animal as a result of them wandering away. Australian Kelpies are capable of single handedly driving livestock long distances in very extreme conditions. They seem to have a natural type of instinct and disposition for managing herds of livestock. It doesn’t mater if the stock is cattle, pigs, sheep, goats or even poultry the Kelpie does an admirable job of taking care of their flocks.